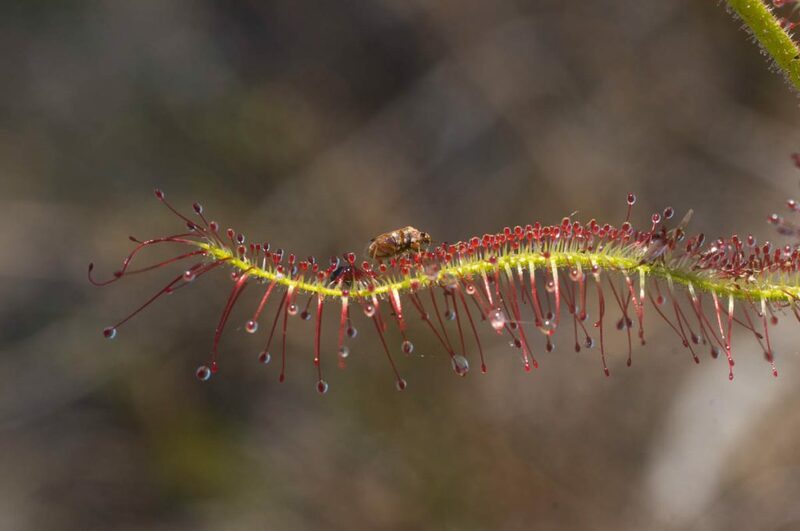 Of the eight species of sundew, Drosera, at Phillipskop, Drosera cistiflora has the largest and most beautiful flowers. The flowers are in shades of white to pinkish white and 5 to 6cm across. At the base of each petal is a very dark iridescent spot. This spot attracts the primary pollinators, monkey beetles (Hopliini). The flowers have 5 stamens and 6 styles (or rather 3 styles, each deeply split into 2). The styles arise from the top of the ovary in the middle of the flower but spread further than the stamens. It is an unusual arrangement typical of members of the genus but rare outside the family. It is presumably a mechanism for reducing the risk of self-pollination. 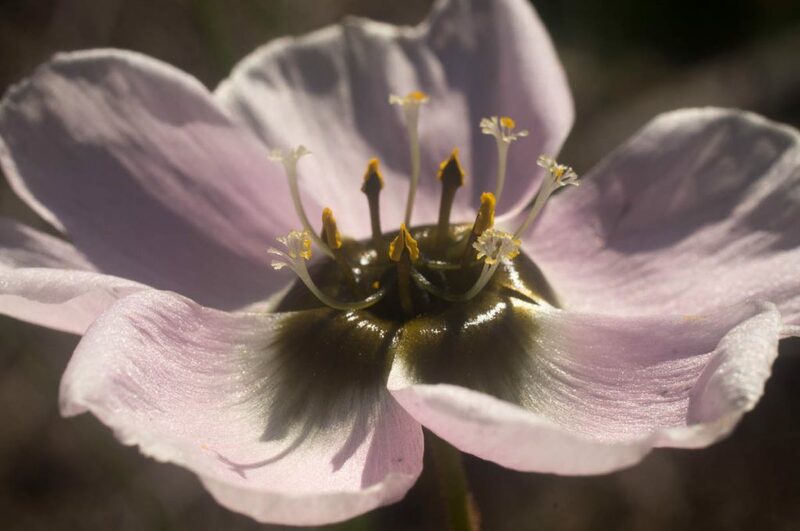 The species name of Drosera cistiflora refers to having flowers of the genus Cistus. Cistus is a Mediterranean genus in the rock rose family (Cistaceae) with large white to pink 5-petalled flowers. The specific name is therefore very apposite, though Cistus has a boss of numerous stamens in the centre unlike Drosera. Some species of Cistus, e.g. Cistus ladanifer, also have the dark spot at the base of the petal accentuating the similarity. Apart from the large flowers for the genus, Drosera cistiflora can be distinguished by the tall stem with long narrow leaves all the way up without any notable stipules. Although the species here, and throughout most of its range, has white to pink flowers, in the Malmesbury area there is a very eye-catching red form. Drosera are popular because of their renown as carnivorous plants. 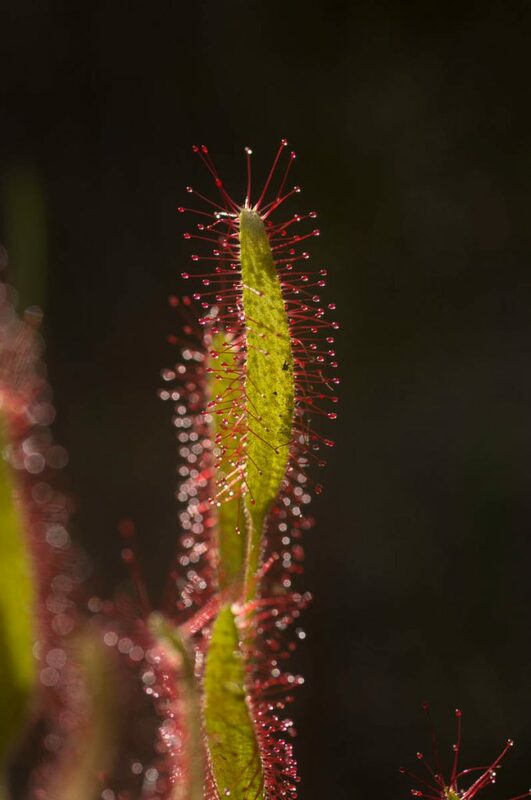 They all have sticky leaves that catch insects and Drosera cistiflora is no exception. The leaves have a mixture of long hairs with sticky bulbous ends, intermixed with shorter glandular hairs. These sticky hairs adhere to the small insects that land on them. Digestive enzymes are then excreted that breakdown the insects, releasing nutrients that are absorbed by the plants. The challenge for plants like these is that they need insects not just as food but as pollinators too. It would not be a clever strategy to trap and digest the insects that are just about to carry your pollen to another plant. 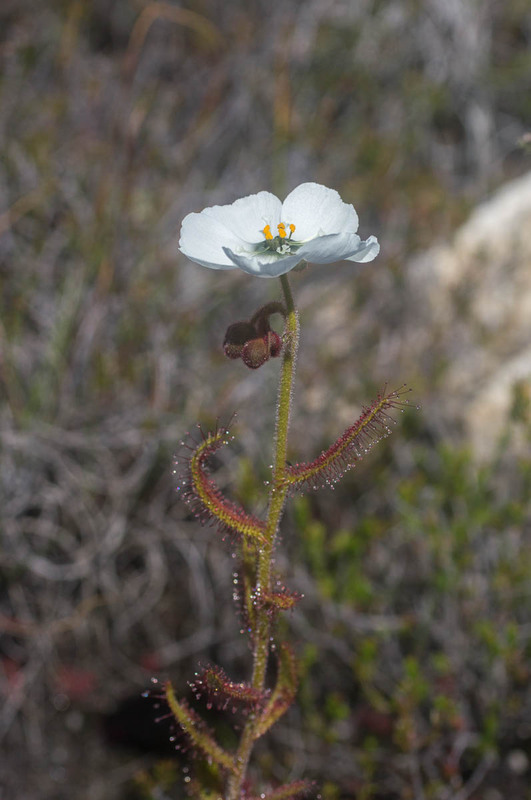 One study looked to see if this was the reason that Drosera cistiflora holds its flowers high above the leaves: https://www.ncbi.nlm.nih.gov/pmc/articles/PMC2944978/. However, it appears that the height of the plant is more to do with attracting pollinators than avoiding trapping them on the leaves. August, carnivorous, Cistus, Drosera, Droseraceae, September, Spring. Bookmark.